Crude oil and natural gas are mixtures of hydrocarbons-chemical molecules that contain only hydrogen and carbon. Crude oil is a liquid both underground and at normal surface conditions. Natural gas is a vapor at normal surface conditions; underground, it can exist either as a vapor or something like a bottle of carbonated soda-"in solution" with crude oil until the pressure is reduced. The term "petroleum" collectively refers to crude oil, natural gas and solid hydrocarbon mixtures like tar and asphalt. In addition to hydrocarbons, petroleum may contain impurities such as water, sulfur compounds, oxygen, nitrogen, carbon dioxide and traces of metals. The smallest unit of a hydrocarbon compound is a molecule consisting of hydrogen and carbon atoms. The physical properties of a hydrocarbon mixture - whether it exists as a solid, liquid or gas under a given set of conditions, how much energy it contains, what products can be derived from it and so on - are determined by the numbers and configurations of atoms contained within each of its molecules, and how much these molecules weigh. The simplest hydrocarbon molecule is methane. It is the essential ingredient of natural gas, and the source of the "blue flame" that we see when we turn on a gas stove or furnace (Figure 7). Methane consists of one carbon (C) atom and four hydrogen (H) atoms. Thus, its chemical formula is CH4 or, in abbreviated form, C1. Figure 7: The familiar blue flame that characterizes the combustion of methane, the key component of natural gas. The more atoms a molecule contains, the heavier it is. The molecular weight of ethane (C2) is 30, while that of propane (C3) is 44 and that of butane (C4) is 58. The heavier a molecule, the more likely it is to exist as a liquid at normal surface conditions. This is based on its higher boiling point (i.e., the temperature above which it changes from a liquid to a gas at atmospheric pressure). It is also more likely to have a higher energy content or heating value per unit volume. Methane, ethane and propane each have a single molecular configuration. Butane (C4H10), however, shows two possible arrangements (normal butane and iso-butane), and each arrangement has unique physical properties. Because a simple, heavy hydrocarbon molecule can contain as many as 66 or more carbon atoms, the variety of molecular arrangements that can be present in a mixture and therefore, the range of physical characteristics is immense. Figure 8: Atomic structure, chemical name and potential uses of the hydrocarbon molecules methane (C1) through normal and iso-butane (n-C4 and i-C4). Natural gas mixtures fall into two general categories: dry or lean natural gas has high concentrations of methane and ethane (typically 95 percent or more), while wet, or rich, gases have higher concentrations of propane, butane and the intermediate-weight hydrocarbons pentane (C5) through heptane (C7). As the proportions of heavier molecules in a hydrocarbon mixture increase, it is more likely to exist as a liquid at atmospheric conditions. Naturally occurring hydrocarbons come from the decomposed remains of ancient plants and animals. Through a sequence of geologic events that occurred over millions of years, organic material was deposited on the Earth's surface and then transported to depressions or basins, where it accumulated and gradually became buried at great depths under layers and layers of sediments. There, in what geologists refer to as source rocks, it was subjected to much higher pressures and temperatures. Over time, and through a series of intermediate chemical reactions, some of this material eventually turned into petroleum. In general, the deeper a rock formation is located in the Earth's crust, the higher its temperature will be. Thus, the type of petroleum that formed through these processes depended largely on the depth of the source rocks. In relatively shallow source rocks, where temperatures ranged from about 60 to 80°C [140 -176°F], the organic matter was converted into heavy oil. At lower depths and higher temperatures, from about 80°C to 175°C [176°F to 347°F], the heavier, long-chain organic molecules began to break up into shorter molecules and form medium and light oil. Where temperatures exceeded 175°C [347°F], the molecules became even shorter and lighter, with more and more matter transformed to rich gas until, by the time it had reached 600°F [315°C], all of it had been transformed to dry gas (methane). Figure 9 shows the wide diversity that exists among petroleum fluids discovered worldwide. 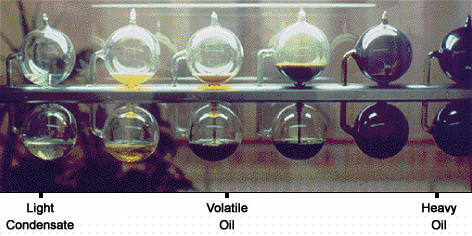 Figure 9: Selection of petroleum samples ranging from a heavy black oil on the right to a light condensate on the left. The source rocks in which petroleum formed millions of years ago are not the same rocks in which it is found today. Rather, oil and gas, being lighter than the water normally contained in rock formations, moved upward by gravity forces from the source beds along permeable migration paths. Eventually, it accumulated in reservoirs contained within geologic traps, surrounded by impermeable cap rocks or seals that keep it from traveling any farther (Figure 10). 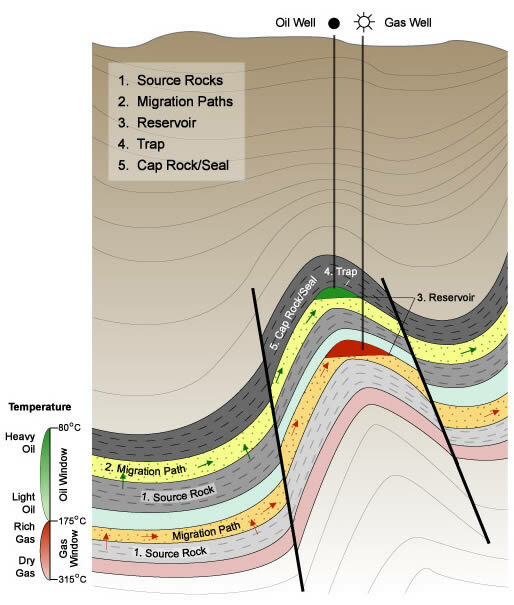 Figure 10: Cross section showing source rocks, migration paths and reservoirs in a sedimentary basin similar to the North Sea basin. After oil and gas form in the source rocks, gravity causes them to migrate upward until they are trapped in a reservoir waiting for discovery. The term "reservoir" brings to mind the image of a large pond or lake, so it is natural to hear the term petroleum reservoir and picture a huge underground "pool" of oil. In reality, a petroleum reservoir is a porous, permeable rock formation, in which oil and gas are contained in the empty spaces between the rock grains. These spaces are interconnected, thereby forming channels or conduits through which fluids can flow to a well, and from there to the surface. The fluid that comes out of a typical oil well is actually a combination of crude oil and natural gas, often mixed with water, non-hydrocarbon gases and other impurities. That is the reason why the volume of crude oil and natural gas is so different from the reservoir conditions and surface conditions, as shown in Figure 11. Figure 11: Hydrocarbon fluids change state as they travel from the reservoir to the surface. The first step in processing this fluid is to route it to centralized surface handling facilities, where carefully designed vessels are used to separate the oil, water and gas into individual streams. The water is pumped back into the reservoir or otherwise disposed of in an environmentally friendly manner. The oil is metered and stored in tanks to await pipeline or tanker transport to the point of sale, and the gas is treated or conditioned to remove water vapor and other impurities and processed to recover gas liquids before being metered and sold. 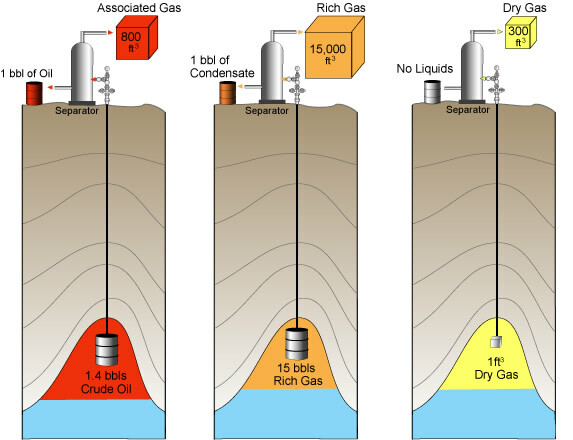 Figure 12 shows the representative compositions of various produced fluids after separation at the surface, including a crude oil with associated gas, a wet (rich) gas and a dry (lean) gas. Figure 12: Representative compositions of various produced fluids after separation at the surface. Note that C7+ refers to the composition of C7 plus all the heavier hydrocarbons. If the treated gas is dry or lean (i.e., contains mostly methane), it may either be compressed and sent directly to its point of sale through high-pressure pipelines, or it may be turned into liquefied natural gas (LNG) by cooling it to temperatures as low as -160ºC [-258ºF]. LNG occupies only about 1/625 of the volume of dry gas, allowing it to be transported to distant markets in specially designed ships. If the gas is wet or rich (i.e., has substantial amounts of ethane or heavier hydrocarbons), one post-treatment option might be to send it to a gas processing plant. There, it may be cooled to around -150ºF [-101ºC], causing these hydrocarbons to condense to NGL (natural gas liquids). The NGL is then sold to a refinery or petrochemical plant. If sufficient NGL is available, it may be economical to separate it further into its constituent hydrocarbons. This involves a process called fractionation in a series of columns, where the NGL is sequentially warmed to higher temperatures, causing the individual hydrocarbons-ethane first, then propane, then butanes-to boil off and then condense. Propane, butanes and their mixtures are referred to as liquefied petroleum gases (LPGs).This leaves a residual, Natural Gasoline, which can be stored at atmospheric conditions (Figure 13). Natural gas, LNG, NGL, LPGs and the hydrocarbons that come from them all have individual markets, and all of them are in their final form to be used as fuels or for manufacturing petrochemicals. 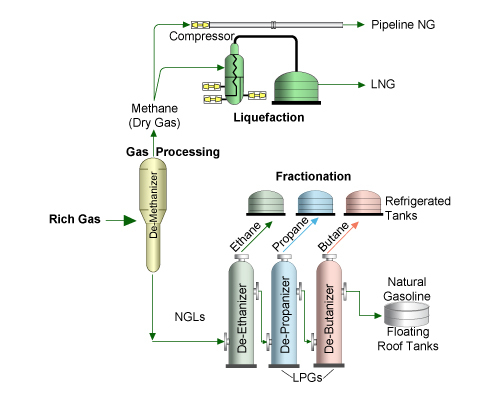 Figure 13: Rich gas is separated by gas processing into dry gas and NGLs. The NGLs may be sold to a refinery or petrochemical complex, or separated by fractionation into individual hydrocarbon liquids. Except for a few special power generation applications, most crude oils are not suitable for use as finished products. In nearly all cases, they must be refined to satisfy specific markets. Figure 14 illustrates, from left to right, the basic processes involved in refining crude oil. Initially, products may range from light gasoline vapors and LPG to heavy residuals ("residuum"). Depending on market demand, these first "cuts" will proceed to more complex processing into final product blends (e.g., seasonal transportation fuels, heating fuels and special products like lubricating oils and asphalt). The refiner's ultimate goal is to maximize the crack spread-the per-unit difference between the product revenue and the cost of the crude oil. If the products sell for $52 per barrel, for example, and the cost of crude is $47 per barrel, then the crack spread is ($52-$47), or $5 per barrel. 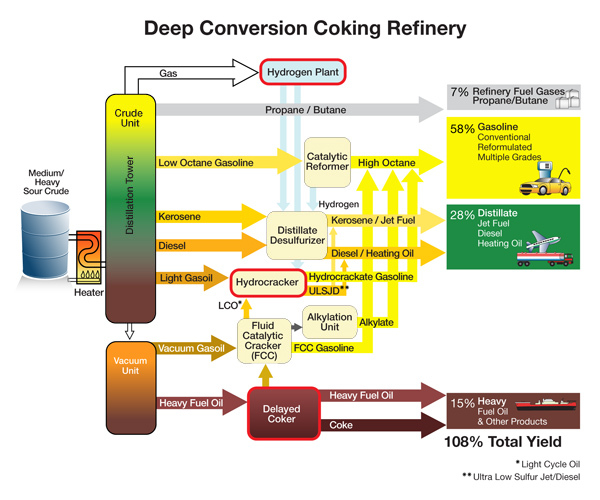 Figure 14: Simplified schematic of a refinery showing how a crude oil turned into an initial "cut" of refined products. Natural gas, natural gas liquids (including LPG) and the various refinery cuts may also be used as raw materials or feedstocks for manufacturing petrochemicals. For example, methane can be used to make ammonia for fertilizer, and ethane can be used to make ethylene, the first step in making plastics. Table 1 lists some of the major categories of products that come from petrochemicals. Consider which of these products you use daily, and what would you do or what would be your alternatives if these products did not exist. Table 1: Major petrochemical products produced from hydrocarbon feedstocks.